In this module you will learn how to combine creativity and management techniques to solve difficult problems, to develop innovations, and to start successful businesses and social organisations. You will learn how to analyse people's existing behaviours and tools, to work with them to develop a vision, rapidly develop and test prototypes, and document design ideas to attract collaborations and funding. You will use these techniques, working with a range of leading practitioners (including Highly Sprung and Limina Immersive), to develop an idea for the Coventry City of Culture programme. You will develop skills in team collaboration, problem solving, observation, analysis and public communications. This provides a superb grounding for working in many industries, or as an enrepreneur - Design Thinking is a foundational skillset for innovators and change agents in all fields. In the last twenty years design has rapidly evolved from being a specialism undertaken by elite professionals using rare and often mysterious methods, hidden away in studios. Designers are now out in the world, in all kinds of places, working amongst the people who really matter, the people who ultimately benefit from their work. They work with participants: to observe and understand; to develop useable context-related design knowledge; to inspire insights, pose worthwhile design challenges; to collaboratively develop briefs and respond with design ideas that stand up to rigorous testing, but which also ensure that people are engaged and inspired. Design Thinking is the name we give to this new approach to designing: out there, working with people, to achieve great things and to overcome challenges using designerly methods. And often going further: enabling participants to think and act like designers, to adopt designerly ideas and methods. 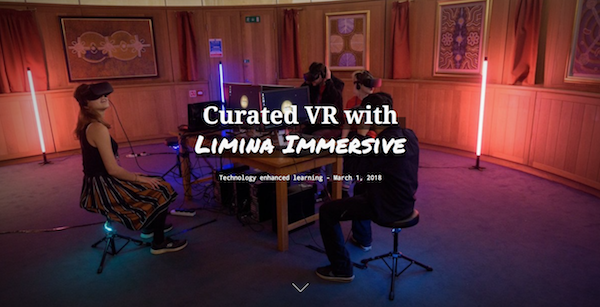 For an example of the successful application of Design Thinking by a Warwick grad (Catherine Allen, Theatre Studies), see this design study of Curated VR with Limina Immersive. Design Thinking has transformed innovation approaches in business, social innovation, medicine, education, creative and cultural industries. We have worked with Warwick students and alumni over many years to use Design Thinking to develop successful initiatives in many fields, and have now developed this into an exciting new interdisciplinary module. Designed by practicing designers using Design Thinking methods, this interdisciplinary module provides an induction into Design Thinking as research and practice, as applied across all of these fields. It gives the students a framework, based on experience and research, that they can use to better understand and transform the world through innovation and enterprise. It aims to be a transformative experience for the students, giving them a powerful set of capabilities through which they can interpret and change the world around them, with positive social and economic impacts. After completing the module, students will have a powerful and far reaching "designerly" way of thinking and acting (Lawson, 2005). They will apply this during the module to a series of "design challenges", collectively exploring the challenges and "wicked problems" (Buchanan, 1992), defining design briefs, and developing design ideas – one of which will be developed into a more detailed proposal with prototypes. Design challenges will be defined by experts from a variety of domains, including creative industries, education, regional development, social innovation and (most excitingly) the Coventry City of Culture 2021. The module is very much practice-oriented, but with a solid basis in the history and interdisciplinary theory behind Design Thinking. We use interactive lectures, extensive summaries of readings, video interviews with successful designers and Design Thinkers, to rapidly but effectively give a useable grounding to all the necessary theory. Weekly workshops with experts from a range of fields (WBS, WMG, Theatre Studies, Cultural and Media Policy Studies, creative industry practitioners) are used to introduce and explore the most useful creative and formal methods for observing designs in use, generating insights, creating and testing design ideas, building and sustaining collaborations, and moving design ideas into fully developed and implementable propositions supported by stakeholders and potentially by funders. A range of experts will help to introduce the design challenges and provide guidance and feedback. Finally, we ensure that at all times guidance is given as to how lessons learned may be applied in further studies, career development, innovation and enterprise projects. The module puts its students at the heart of a network of Design Thinkers and people who may support their further endeavours. Indicative weekly topics. Note that we have included a degree of flexibility in our plans, so that students may co-design and refine aspects of the module. Before week 1: we have some online resources that you can use to prepare for the module, this includes support in considering how your existing skills and experiences (e.g. film making, photography, creative writing, social science - the list is really broad) are invaluable tools that you can use in Design Thinking. Design Challenge A: we have a simple design challenge for you to do before we start - reflect on your own design history, creating a brief design study of a designed artefact, place or process that you have found really useful, or one that you have stopped using for some reason. Theme: What is (a) design? What is Design Thinking? Methods for observing designs-in-use. Overview: This first week will be quite intensive. We need to quickly get oriented and focussed on what it means to think like a designer, and most importantly, start doing it: think and act in a 'designerly' way. Design Challenge B: Doing design anthropology in the wild - get out there, observe, interact, participate, document designs in action as experienced from the inside (in groups of three students). Theme: Analysing and evaluating designs-in-use and design ideas. Using the Fit, Stick, Spread and Grow framework. Overview: Look critically and creatively at designed things, both as designs-in-use and in the intentions of the people who made them what they are. This is one of the most powerful capabilities that you can have! Design Challenge C: Investigating fit, stick, spread and grow to test a design idea - select from a range of exciting design ideas, take it out into the world and do experiments and research using formal methods to evaluate its value (in groups of three students). Theme: Creating good design ideas to fit, stick, spread and grow. Overview: This week we will rapidly progress from observing and evaluating designs and design ideas, to creating fresh ideas of our own. This is the time to be creative! But don't be scared. There's an art and a science behind being creative, and you can all learn how to do it. Design Challenge D: Making Warwick University a place for student enterprise, innovation and creativity - develop design ideas, as radical and imaginative as you like, and pitch them to key decision makers at Warwick University. Theme: Managing design capability within organisations. Developing your professional portfolio and your reflective essay. Overview: Develop and sustain design capability. This week we will look at how we can collectively create and care for design capabilities, how we can spread and embed capabilities and designerly culture across organisations, so as to continually improve designs and designing. Design Challenge D (continued): D: Making Warwick University a place for student enterprise and innovation. Theme: Designing for tackling wicked problems. Developing the major design study. Overview: This week we will have a go at exploring the frustrating world of wicked problems, and using Design Thinking strategies to deal with them. Design Challenge E: Coventry City of Culture 2021 - produce a fully developed and implementable design proposal for an initiative, project, business or event that delivers the aims of the City of Culture, and which engages people from across the City, with significant and "emotionally durable" impact. Overview: In the second half of the module we have space for three sessions that will be co-designed by all of us: teachers and students. Design Challenge E: Continue working on Coventry City of Culture 2021. Overview: This week is dedicated to finishing and presenting your major Design Thinking project (your response to Design Challenge E). It will be an open showcase, to which we invite people from beyond the module who have given is advice and support in meeting the challenge. We will also celebrate everyone's contributions, and reward special contributions with prizes. Overview: Drawing the module to a close, we will look back on everything we have covered and all of the experiences we have had in addressing the design challenges. We will also consider how you might engage in Design Thinking at Warwick and beyond in the future. Design Challenge F: Portfolio and reflective essay completion. Individually. "Magazine style" means written for and interesting to a general non-specialist audience, using Design Thinking ideas to help them to understand a design challenge, a design idea or an implemented design. You can see an example of this style by Robert O'Toole here. 1 x 600 word design study).